Unless you had a really good year, your hunting season probably didn’t end with the sunny autumn days of archery. As the winter progresses, late-season rifle outings will test you from start to finish. Avid hunters will be out before dawn, sitting all day at their spot, then likely hiking back in the dark. It’s going to get cold. Each type of hunting and objective is different. Spot-and-stalk requires active layering with options for adding to your system when you stop moving. Treestand hunters will need to layer for sitting stationary for long periods of time. Waterfowl hunters need waterproof layers and a similar level of warmth as treestand hunters. 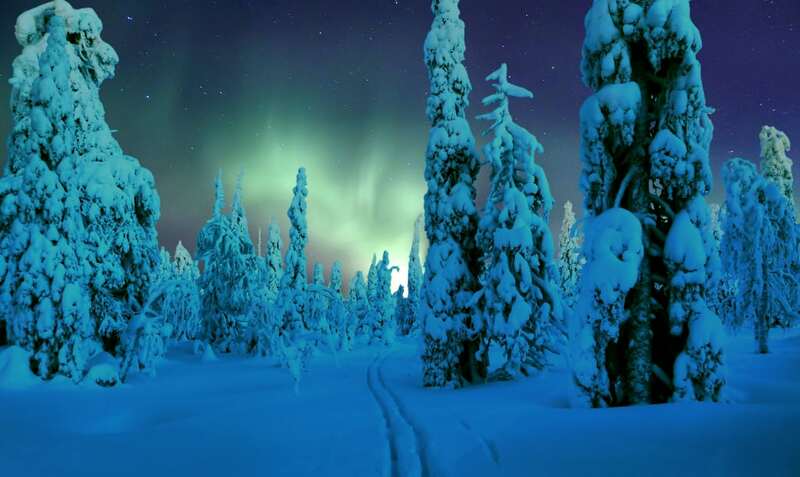 The layering components for all types of winter hunting are similar though: Everyone needs a wicking base layer, a mid-layer which can be as light or heavy as the conditions demand, a down-filled jacket for packable insulation, and a weatherproof outer shell to protect against precipitation and wind. For the base layer, you want a technical fabric that is able to manage your body’s temperature when you’re active. Clothing using fabrics with 37.5 Technology does just that. 37.5 Technology features patented, naturally-derived particles that are permanently embedded into clothing fiber to capture and release moisture. It’s able to actively respond to body heat, accelerating the speed of turning liquid (sweat) into water vapor. The hotter you get, the better the fabric is able to remove moisture and leave you feeling comfortable. The goal is to keep your body at the ideal core temperature of 37.5 degrees Celsius. Clothing using 37.5 technology will dry up to five times faster than similar fabrics, avoiding the wet, clammy feeling that you can get with other base layers. Plus 37.5 fabric is created with natural materials, so there are no chemicals to irritate your skin. 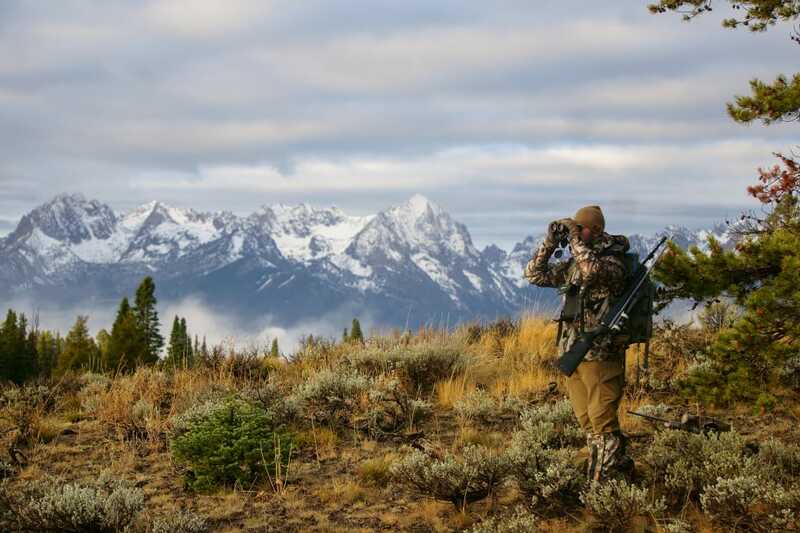 Hunters who have short bursts of activity followed by prolonged periods of stillness will significantly benefit from the ability of the fabric to help regulate your body temperature while remaining comfortable in cold weather. The style of hunting you do, however, will greatly influence how you put together a winter layering system. Here are the basics to keep you warm and comfortable, allowing you to stay out longer and enjoy the experience more. Spot-and-stalk hunting requires gear that allows you to release heat while hiking yet keep you warm during periods of stillness. 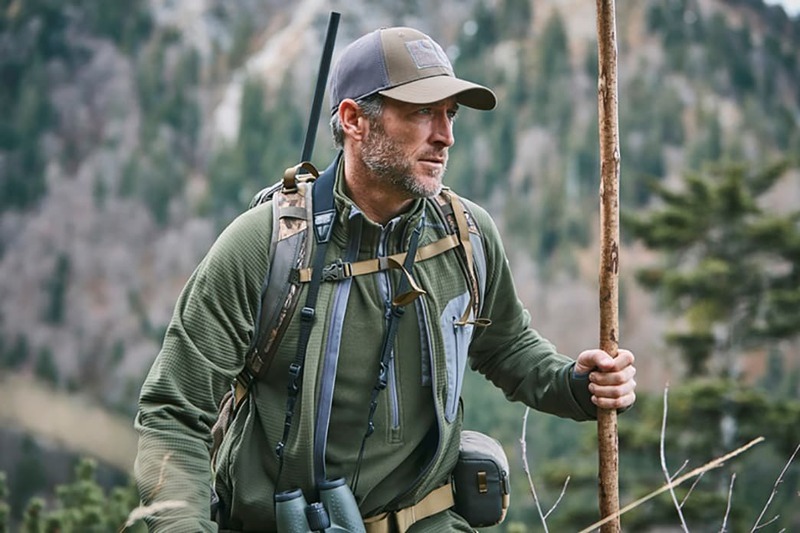 Spot-and-stalk hunting consists of high-energy bursts followed by periods of stillness, either stalking or glassing, and your clothing should reflect that. These systems essentially replicate cold-weather hiking clothes with an additional beefed-up insulation layer for when you need to remain still. You’ll want all layers to be convenient and quiet, yet durable for tricky terrain and bushwhacking. This can be a tough balance to strike, as you will need to be adjusting layers depending on effort and output. You want every layer—including windproof and insulation—to work together and be breathable for higher exertion and not staying damp when sitting on an exposed, windy ridge. Base Layer : An active-blend, wicking top and bottom is crucial here. First Light has created a product line with 37.5 fabrics called Aerowool Ultralight and Lightweight that is a good option for hunters on the move. The Fuse Crew is the go-to base layer for the broadest range of conditions. Mid-Layer : A light fleece or merino layer that can be unzipped or vented when you heat up. The Merino 37.5® Crew Shirt from Merkel Gear features a combination of polyester and merino wool to get the best of both worlds. The robust, yet very soft and densely knitted merino wool leads to an unequalled insulation and perfect weight to warmth ratio. Insulation : A down layer that can be packed during travel and pulled out for glassing or resting. This should be high quality and packable, with at least 750 fill, a deep hood, and windproof face fabric. Outer Shell : A windproof vest is an excellent addition to your weatherproofing, as it allows venting under the arms while providing warmth to your core. A burly outer shell is also necessary, and it should be breathable and also provide body-mapped insulation. Pit zips are a useful feature to look for, providing more venting in case you don’t want to take the jacket on and off. For pants, the Palearctic Mountain Trousers are the can’t-beat option for mountain hunting and game stalking. They’re incredibly robust with double-weave stretch fabric in combination with waterproof knee and backside parts. Accessories : A wool or insulated hat should be easily accessed for optional wear depending on energy exertion. Taking your hat off is the rough equivalent to removing a layer, and can be done on the fly. The Carhartt Force Extremes Knit Hat fuses classic style with the ultra performance of 37.5 Technology. Dress in layers with lots of zippers to help you regulate your body temperature. This is where you want your layers to be both well insulated and have a quiet face fabric. You’ll be switching layers less here—people sitting in treestands during the winter probably won’t be removing much clothing. Remember that your entire backside will be pressed against a metal seat. A set of insulated bibs layered over your other clothing will help ensure the wind doesn’t get into gaps in a seated position, and many whitetail or treestand-specific bibs feature added insulation panels in the backside. Base Layers : The warmer, the better, so opt for a heavier-weight option. These include base layer bottoms—your legs want to stay warm, too. First Lite’s Furnace Henley is what you want to battle the coldest temperatures. It provides additional lofted insulation in addition to moisture management. Mid-Layer : Again, go heavier. Bring more than one option for mid-layers, including a heavy fleece and a down vest. Berber fleece is never a bad idea, and if one of your mid-layers has a hood, even better. Insulation : Either synthetic or down will work, as you won’t be packing it far. Leave the jacket off for the walk into the treestand, then throw it on once you’re set up. Outer Shell : This can be a combination of a hardshell and a set of bibs, but make sure the face fabric is brushed. Treestand hunting means close quarters and a rough shell fabric can be a dealbreaker. Accessories : Trigger-compatible windproof gloves, a neck gaiter, wool socks, and a beefy hat should round out your winter treestand outfit. Waterfowl is where you get real cold, real fast. Jump shooting will keep you somewhat warmer than sitting in a blind, but overall the activity is going to be less intense than hiking through the mountains. The wind off the water can be ghastly, and you should be dressed in windproof layers head to toe. On top of staying warm while waterfowl hunting, you also need to stay dry, adding more consideration to your system. Base Layers : Again, these next-to-skin layers should be moisture wicking and comfortable. Opt for heavier weight with these to give your core more of a chance to stay warm. In cold weather, be sure to include bottoms as well, such as the Merino Long John 37.5 from Merkel Gear. Mid-Layer : Like treestand hunting, the more layers, the better. You can always take layers off and stash them in the blind or in your pack. Shedding or adding layers is easier with bird hunting, without quite the same amount of stealth needed. Insulation : A down jacket with a slim profile, built for layering. Once this goes on, it will probably stay on. This will also be under your waterproof jacket at all times, so you want to make sure the sleeves are articulated and the jacket fits well for a full range of motion. Outer Layer : Your jacket should be waterproof and windproof with plenty of expandable pockets for shells. If you have a bird dog, it’s less likely you’ll be going into the water, but the potential is always there. Waterproof pants built with a waterproof, breathable membrane are also windproof, which will be a huge benefit if you’re planted in a windy area. Remember, you want to be windproof head to toe. Accessories : Waterproof boots, waterproof pants or waders, and windproof gloves should be part of your kit. A hand muff to keep toasty in between action isn’t a bad idea either. Frozen fingers will be a bummer during that low flyover. While it may be more work hunting in cold weather, the rewards are big as well. Learning to dress properly can be a game-changer. It’s the difference between an enjoyable day doing what you love and a miserable time regretting the decision. Doing your homework and having the right gear makes your trip one to remember—for the right reason. For more gear ideas featuring 37.5 Technology, visit the 37.5 partner page. Written by RootsRated Media for 37.5.